I would like to know if there is any recently changes made on WHO wasting prevalence. As far as I know less than 5 was acceptable. So if any member of the team knows any changes or updates made on this area let me know. I think you mean that a prevalence below 5% is acceptable. There has, I believe, been no change to this threshold / interpretation. You should be aware, however, that the standard thresholds are problematic when used with prevalence assessed using W/H since this indicator is biased by body shape. This means that in some settings (e.g. Sahel or Horn pastoralists) a prevalence below 5% is extremely unlikely. In such settings it is possible that a prevalence of 15% by WHZ represents an acceptable situation. The dashed 45 degree line corresponds to perfect agreement between the prevalence estimates returned by the two indicators. WHZ and MUAC tends to return similar estimates of the prevalence of global acute malnutrition in Amhara (agrarian) populations but markedly different estimates of the prevalence of global acute malnutrition in Afar and Somali (pastoralist) populations. 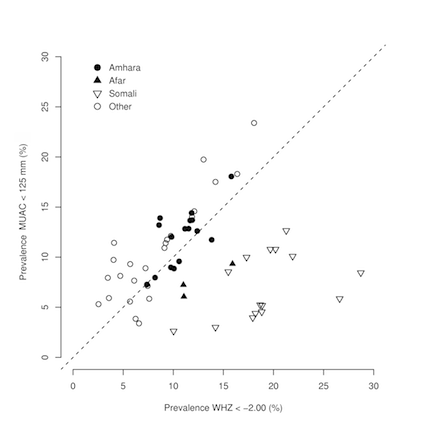 Looking at the Somali data you can see that high prevalence by W/H is not matched with high prevalence by MUAC. In such populations the MUAC-based estimate is most useful.